Our founder, Carlos A. Pinilla, worked in his father’s automotive body shop business since he was 7 years old. As he got older Carlos grew curious about Manual Lathe machines, when his father would send him nearby to buy materials, he would stop to watch the Lathes working in different shops in his hometown. At 15 years old he went to the local Vocational School to sign up for Diesel Mechanics, however since there were no more spots open he opted for Maintenance Mechanic. As he was approaching the end of his studies, because he was at the top of his class he was granted a spot to study General Mechanics Technician. At the same time he also studied to get his High School Diploma, graduating with the third highest score nationwide. He started his own small business and later on he also studied Machinery Design. All this gave him the knowledge and capability to grown his company and be successful in his hometown. Due to hardship in his country he was forced to migrate with his family to the U.S.A. He worked two jobs to sustain his family, but that did not stop him from succeeding. 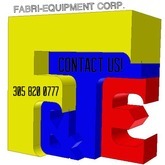 Finally, in 2004 he was able to open his business again, Fabri- Equipment Corp. At the beginning he worked fulltime as Machine Shop Manager & Tool Designer at another company, all while he worked long hours to serve his new customers and grow his new company into what it is today. He continues to manage his company with the same hard work, perseverance, and consistency he installed in his beginnings. 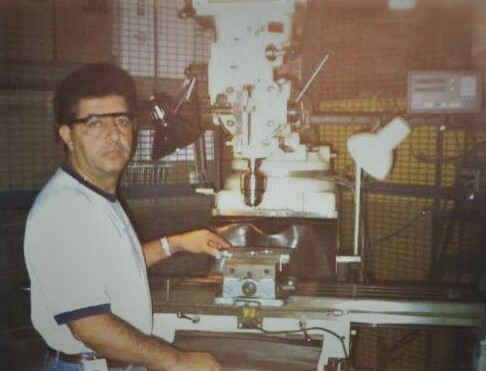 Carlos A. Pinilla working with a Milling Machine in 2002. 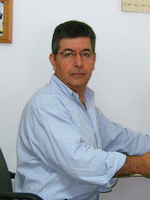 Carlos A. Pinilla in his office at Fabri-Equipment Corp.